Willets Belleek HP Art Nouveau Poppy Teapot Set Artist Signed Pickard Era. 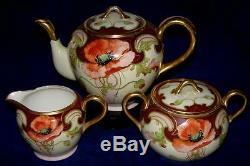 Seldom Seen Antique Willets Belleek Hand Painted Art Nouveau Poppy Four Piece Teapot Set. Set includes Teapot (measures about 5 3/4" to top of lid finial and 9" handle to spout), Sugar Bowl & Lid (4 1/4" to top of lid finial and 6 1/4" handle to handle) and Cream Pitcher (3 1/4" at tallest & 5" handle to handle). Teapot is Signed by Artist'Schindler' as pictured. Sugar Bowl and Cream Pitcher are Signed'Sch'. John Schindler was a well known Artist and outstanding china painter who was also associated with Pickard China Painting Studio. After Pickard Artist John Fuchs died, Schindler even lived in Fuchs home until Fuchs's wife kicked him out for his paint experiments splattering all over her kitchen. Schindler also worked for Frank Yeschek's'Ceramic Artcraft Studios. This Set displays nicely but does have some issues. Cream Pitcher has no chips or cracks with some gold wear. Sugar Bowl has a chip on one of the handles (see photo). The Teapot has gold wear and has chip on rim (under the lid) that does not show as displayed, see photo. Underside of lid looks like it could possibly have a repair. All pieces are Willets Belleek blanks and have that underglaze mark. Also have the D'Arcy Decorating Studio overglaze mark. Any white spots are glare. Add to Your Collection or a Perfect Gift for Someone Very Special!! C ame from a Dallas a rea estate. Please take a peek in my store for more antiques and vintage collectibles. Please visit my other auctions for more great looking antiques and collectibles. I go to 10-15 estate sales per week looking for interesting collectibles and antiques, never knowing what I might find. New items are added all the time. Get Images that Make Supersized Seem Small. Auctiva's Listing Templates improve your auctions in minutes. The item "Willets Belleek HP Art Nouveau Poppy Teapot Set Artist Signed Pickard Era" is in sale since Wednesday, October 12, 2016. This item is in the category "Pottery & Glass\Pottery & China\China & Dinnerware\Pickard". The seller is "suzanneccurran" and is located in Plano, Texas.